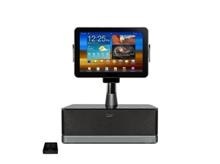 iLuv, a popular accessory manufacture has rolled out its first ever speaker dock for the Samsung Galaxy Tab 10.1 tablet. The dock includes articulating arm that can rotate, which allows the user to use the Tab in both portrait and landscape modes. An interesting feature is the include IR remote control that lets you adjust volume and hop between tracks from a distance, just like your home theater system. You may find it bizarre but iLuv is the only company right now that is offering an audio dock for the Galaxy tab 10.1. It will available in January.It is also compatible with P1000 and Galaxy tab 8.9 tablet.